Leslie Ray Burton, Jr. 82, passed away on March 18, 2012. He was born on September 6, 1929 in New Gulf, Texas to Leslie Burton, Sr. and Mable Etie Burton. Les grew up in Rosenberg and graduated from Lamar Consolidated High School. He played football, basketball, ran track and was All-District in football and basketball. 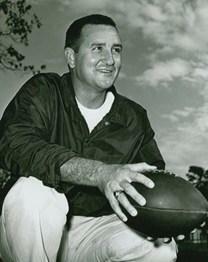 Les attended Wharton County Junior College on a football scholarship where he was an All-Conference Quarterback and was voted Outstanding Back in "The 1951 Texas Rose Bowl Game." He transferred to the University of Houston in 1951 on a football scholarship and played on "The 1952 Conference Champions" team. Les graduated from the University of Houston in 1954 with a Masters of Education degree. He then joined the United States Army in September 1954 as a Second Lieutenant in the Armory Division and served until 1956. Les began his career in education as a teacher and coach at Frank Black Junior High School. He then moved to Reagan Senior High School as the Varsity Football Backfield Coach for two years. During the two years Reagan advanced to the State Quarter-Finals. Waltrip Senior High School opened in 1960 and he became the Head Football Coach. During his seven year tenure, Coach Burton led his team to the State Quarter-Finals twice and won three District Championships. Thirteen boys on his final Waltrip team received college scholarships. Coach Burton made a lasting impression on his players and remained in contact with the "Burton Boys" throughout the years. In 1970 he was asked to set up a security department for the Houston Independent School District by the Superintendent. He organized what is now called the HISD Police Department and served as Chief of Police for twenty-four years. Les is survived by his wife of 57 years, Catherine, sister Marjorie O'Farrell, son Leslie Ray Burton, III and wife, Debbie, son Kelly Lane Burton and wife Beth, and four grandchildren he adored, Kendall Grace, Hunter Ruslon, Audrey Lane, and Blake Anthony Burton along with a number of loving nieces and nephews. Special thanks to Leslie's dear friends Joe Tusa, Shirley Kennelly, and Allan Bragg. The family would also like to extend their appreciation to Houston Hospice and pallbearers: Glenn Smith, Jimmy Adams, Don Ellisor, Norman Adams, Bill Lewis, Allen Gieser and honorary pallbearers: Tom Gann, Don Dixon, Myles Schutte, and Les O'Farrell.